Budds' Chev | Blog | Tire pressure: Have you checked yours lately? Tire pressure: Have you checked yours lately? Open the driver’s door of your car and take a look at the sticker fixed to the door frame. The numbers you see there tell you how much air you should have in your tires. These calculations are the result of testing—and it’s sensible to heed what they say. The grip your tires get is governed by how much of each one is actually in contact with the road. We call that area the contact patch—and its size depends on your tire pressure. Overinflate a tire so it starts to balloon—yes, there is such a thing as too much air—and the contact patch gets smaller. That leaves you with less grip. So why not set the pressures very low and have the biggest possible contact patch? You could, but then you’d see the sidewalls bulging out. That leads to a lot of flexing, which consumes energy, builds up heat, and shortens the life of the tire. Flexing also leads to less precise steering. You’d have grip but the steering would feel vague—and soon you’d need new tires. So the manufacturer-recommended tire pressure is a balance between the life of the tire, steering feel, fuel consumption, and grip. This is the other aspect you’re trading off. Higher pressure makes the tire firmer. That translates to more bumps and jolts being transmitted to people in the car. But you don’t want the pressure set too low, because then hitting a curb or pothole might deform the tire enough to damage the wheel. Engineers took all these points into account when they were developing your car, and that’s how they arrived at the recommended pressures. Air is composed mainly of oxygen and nitrogen, and over time those molecules pass through the rubber of your tires. Ignore your tires long enough and you’ll find the pressure in them has equalized with the air pressure outside. In other words, they’ll be flat! Newer vehicles come with TPMS—tire pressure monitoring system. TPMS uses sensors in the tires to continuously measures the pressure in each one. If the pressure goes too low, a warning flashes on the dashboard. Some TPMS systems will actually show you the pressure in each tire. If they do, you’ve got the perfect way to keep an eye on your tire pressure. If yours doesn’t, break out a good pressure gauge once a week and check yourself. If poor grip results in an accident, that’s going to cost you a lot of money. But incorrect tire pressure, especially low pressure, has other costs too. First, all that sidewall flexing means increased drag that you’ll burn more gas to overcome. Second, flexing and heat wear your tires out faster. And third, punctures and other damage are more likely with under-inflated tires. If you mount winter tires on your car, experts suggest increasing the pressures a little above what the vehicle manufacturer recommends. From 20 to 35kPa higher than usual helps offset the slight “squirminess” you might feel because of a winter tire’s more chunky tread pattern. Doing so also allows makes up for when the tires run cooler and for cold winter nights, both of which can drop pressures below where you’d like them to be. 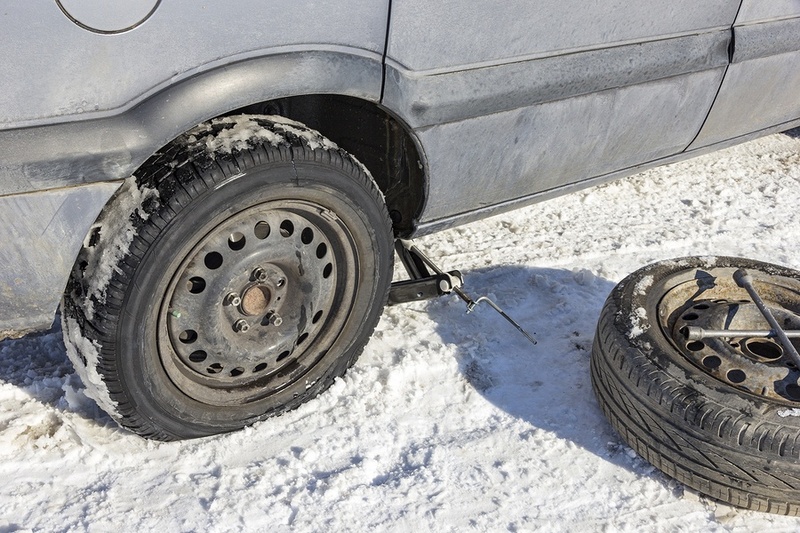 TPMS itself can be an issue if your winter tires are mounted on different wheels. The problem is that your car connects wirelessly to the sensors. If they’re on wheels stored in your garage or basement you might get some unexpected readings! One solution is to have a second set of sensors on your winter wheels, but when switching you’ll need to set them up for your car. This can get fiddly, so most of our customers find it’s easiest just to let us do it for them. Tires can look pretty boring, but they’re all that keeps your car going in the right direction—and a key part of being able to stop when you want. But your tires can’t do those things if they’re not correctly inflated. That’s why regular tire pressure checks are important.